More than nine in ten US over-the-top video subscribers take at least one of the country’s top three services, according to Parks Associates. 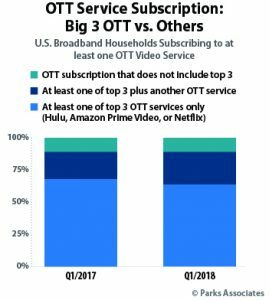 The research firm found that among US broadband households that subscribe to at least one OTT service, 91% took one or more of either Netflix, Amazon Prime Video and Hulu. 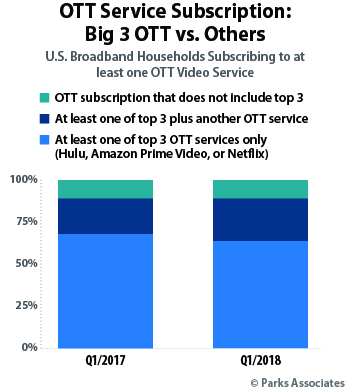 “Many new services, including online pay TV and premium channels, have entered the OTT space in past year, but they have not eroded the position of the Hulu, Netflix, or Amazon Prime Video,” said Brett Sappington, senior director of research, Parks Associates. Hulu vice president and head of research, Julie DeTraglia, is due to keynote at the Parks’ first Future of Video: OTT, Pay TV, and Digital Media conference, which will run from December 10-12 in Marina del Rey, California.